In a busy internet cafe in the centre of Gaza City, lots of people, mostly young, are typing and clicking away. Some of them are engrossed in the world of Facebook. "I use it 10 hours a day," says Mohammed who owns the shop. "I have over 200 Facebook friends." But Hamas, the Islamist movement that controls the Gaza Strip, believes the population's love of social networking websites is making it easier for Israel to recruit spies. Israel has long maintained networks of informers in the West Bank and Gaza in its effort to derail the activities of militant groups. Historically, collaborators have often been killed if discovered, and this week Hamas announced it would execute anyone caught acting as an agent for Israel. 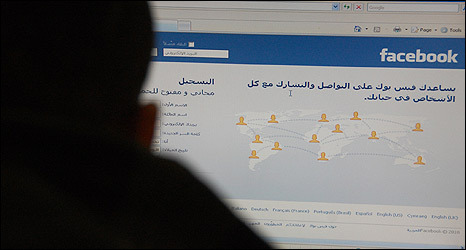 Facebook "is a big, big thing that the Israelis use", says Ehab al-Hussein, a spokesman for the Hamas-run interior ministry. "Many people don't have security sense. They go on the internet and talk about all their personal problems such as with their wives or girlfriends," he says. Israel's intelligence services can then contact people by telephone, e-mail or using existing Israeli agents in Gaza, and use the information to pressure people to become spies. The internet "allows them to make people feel Israel knows everything about them", says Mr Hussein. Ronen Bergman, an Israeli expert on intelligence and author of Israel's Secret War with Iran, says monitoring social networking sites is the very minimum you would expect from his country's intelligence services. "Israel is using the personal information that is put in massive amounts on the internet to identify the people who can maybe help Israel," he says. "If in 50 years they open up the secret files of the Israeli secret service, the Shin Bet, and military intelligence, the sophistication of electronics that is being used by Israel now in the Gaza Strip would put even the legendary Q from the James Bond movies to shame." But Mr Bergman says that the intelligence community's current thinking is that using personal information gleaned from the internet to pressure or even blackmail potential informants is not considered effective in recruiting long-term informants. He says such threats are not often enough to get people to commit such a serious offence as collaborating. But online detail, he says, can help intelligence services identify people who might be useful - such as those with good access to Hamas or to criminal networks. When asked to comment, the Israeli government said it was not its practice to talk about its security services' modes of operation. Even Mr Hussein admits he has a Facebook page, "but I'm careful about the information I put on," he says. "I only say I am a Hamas spokesman." He is probably not the only member of Hamas communicating on Facebook and the internet. This is partly because other forms of communication, particularly mobile phones, are easily bugged and can be used to track movements, Mr Bergman says, so the internet has become a more preferable option. One reason Israeli intelligence is watching the social networking websites to try to identify potential informants is because a historical source of collaborators no longer exists, according to Mr Bergman. Up until the second intifada, or Palestinian uprising, started in 2000, thousands of Gazans had permits to enter Israel each day to work. These people had direct contact with Israelis and were sometimes approached by Israeli intelligence officers and asked to collaborate. But these days the border is virtually sealed. 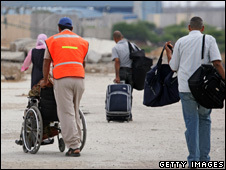 Virtually the only Palestinians allowed through are often in wheelchairs or bandaged up, seeking medical treatment in Israel. Some of those say they've been asked for information about Hamas and Islamic Jihad. "They asked if I knew any people in my neighbourhood who were members," says Khaled, a young man from Gaza City, who will give only his first name. He had to go to Israel to seek medical treatment after being injured in last year's conflict with Israel. He says he did not pass on any information that the Israelis would not already have known. But he gives an insight into how intelligence officers pressure people to become informants. "They say that they know everything about you, but actually it's information you have already published on Facebook," he says. "It's not safe to publish such information - I believe it allows Israel to keep watching our movements." Last year, Israel dismissed as "simply ludicrous" allegations that its security forces had told Palestinians seeking permits to exit Gaza for medical treatment that they would only be allowed to leave if they supplied information on militant groups.